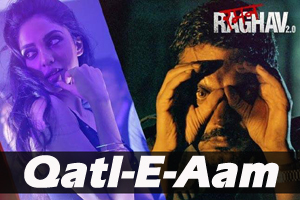 Hindi Lyrics 4 U: Lyrics Of "Qatl-e-aam" From Latest Movie - Raman Raghav 2.0 (2016). Lyrics Of "Qatl-e-aam" From Latest Movie - Raman Raghav 2.0 (2016). A rock song sung by Sona Mohapatra featuring Vicky Kaushal, Sobhita Dhulipala. Star Cast: Nawazuddin Siddiqui, Vicky Kaushal, Sobhita Dhulipala, Amruta Subhash, Mukesh Chhabra, Anuschka Sawhney. The video of this song is available on YouTube at the official channel T-Series. This video is of 2 minutes 09 seconds duration. Lyrics in Hindi (Unicode) of "क़त्ल-ए-आम"